BITTER CREEK Wildlife Refuge, visited November 2008. 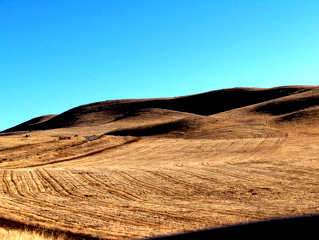 Location: SW corner of Kern County, off Cal. highway 166, south of the Carrizo Plains. Conclusion: This refuge was supposedly purchased to provide habitat for the California condors. However, rating the native grassland ecosystem across the whole 14,000 acres of this refuge, on a scale from zero to 100, and 100 equals pristine, then this entire refuge is bouncing around zero, with the ecosystem in shambles, as a 99.99% weed-infested sterile landscape. The native grassland is so degraded on this site, that it will not restore or recover on its own. It will take the reintroduction of at least 100-200 pounds of local native seeds per acre, to get the grassland ecosystem back in place. The cost to restore this refuge, to plant a thriving native grassland cover, and reintroduce the large mammals like pronghorn, for the condors to eventually eat, will cost between $50 and $100 million dollars. 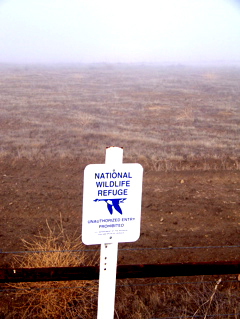 If the FWS is never planning to obtain from Congress, a sufficient budget for the restoration of this refuge, it might be better to sell this refuge back to the ranchers, and buy another property that still has some native grassland habitat on site. Furthermore, if any other lands are purchased by the Federal government in the arid west in the future, as part of the purchase price obtained from Congress, an amount five times the purchase price, must to be requested, to do some ecological restoration on those properties. And all grazing must immediately cease on all Federally owned grassland ecosystems, until the soil phosphorous levels are measured at least once a decade, as I outline in my BLM protest, to assure that the native ecosystems have sufficient amount of phosphorous to survive and reproduce. Sign, showing good quality soil, but no native plant cover left (fog in background). 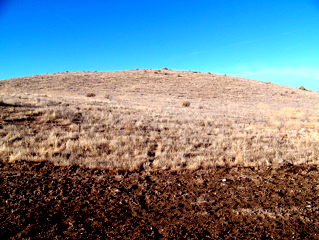 Hill, showing good quality soil, but zero native plant cover, which was the case for all of the refuge, with the native grasslands having been catastrophically removed by grazed, probably 100-150 years ago. Test drill-seeding on the refuge, on a large scale within the last year or two, probably with native grasses, with zero success. Failure is due in part, that the planters did not obtain any licensed native grassland ecological restoration technologies, to get the native seeds to successfully sprout and thrive.